Bright Lights is known for offering classes and camps that integrate Science, Technology, Engineering, Arts and Math (STEAM). We challenge students to be problem-solvers and make connections. Our outdoor classes are no different! Our Aim for the Target class in Week 5 (#818) looks at the physics of the arrow hitting (or missing!) the target. 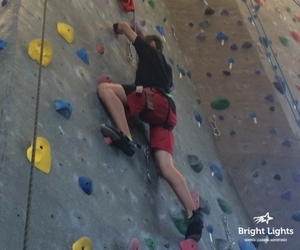 New Heights: Rock Climbing in Weeks 2 and 4 (#306 and #626) pushes students physically and mentally, as they are asked to problem-solve and find the best path to the top. Outdoor Adventures in Week 3 (#416) exposes students to a variety of hands-on experiences such as fishing and working on a ranch, both of which offer science lessons on survival skills and animal behavior. View our Class Schedule and choose what will get your student STEAMed up! Registration opens April 1 at BrightLights.org.